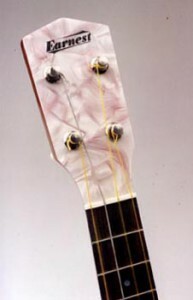 This concert sized ukulele is inspired by the cool ukes of the 1920s and named for the great uke master, Roy Smeck, “Wizard of the Strings.” LeROY is modeled after the Martin Style 1C, and is a flashy uke with “Mother Of Toilet Seat” headstock and binding, rosewood fingerboard, Grover tuners, and classic koa or mahogany body. 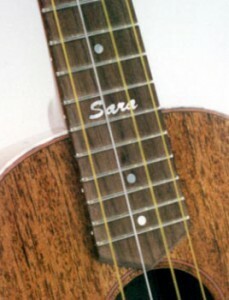 The longer scale length and larger body gives the uke a loud, bright tone with more finger room for tight chords. The thirteenth fret allows for that all-important high C (or Bb), and an optional clear plastic pickguard protects the finish above the soundhole without impairing the tone. Also available in standard soprano and tenor sizes.